Here's something that took me back to the days before Paul McCartney was in that band before Wings. 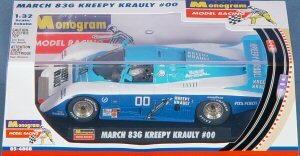 Monogram sent us another of their latest 1/32 scale slot car releases. I remember when whole hobby shops were dedicated to slot car racing, some with HUGE indoor tracks. The smell of arcing brushes and the sounds of torqued up motors definitely brings back memories. Slot cars! Here is a nicely packaged car from Monogram. 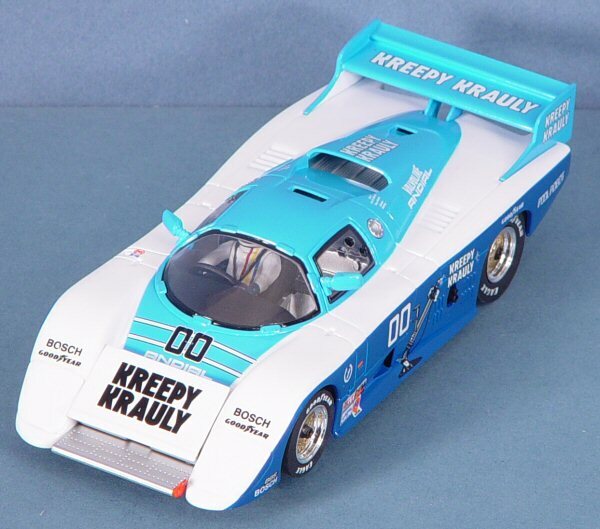 The machine represents the British-developed March 83G Kreepy Krauly #00 road racer. Unlike the slot cars I grew up with, this car has an interior with painted driver figure and a great exterior paint job. The car comes with a storage case that includes a locking screw in the base that holds the car down for storage and transportation. 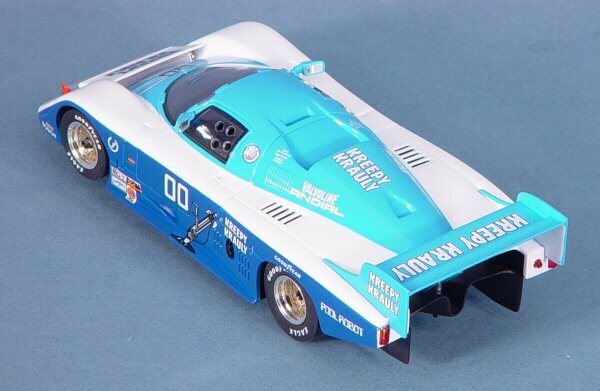 Like the other cars in their slot car line, Monogram has done a brilliant job of combining advanced computer-based painting and graphics with mass production. Each of these cars has a flawless paint job (it won't necessarily stay that way after a few 'encounters' on the track) and a nice storage case to keep the car locked down and safe when not in use. While the Cybermodeler Online Lab doesn't currently have a slot car track, plans are underway to set up a 'test facility' where my wife and I can see who stays on top of the racing pyramid. I must say that the state of the art in slot car manufacturing and finishing has advanced significantly in the [CENSORED] years since I last held a controller in my hands. If this car runs as great as it looks (and I don't doubt it), Monogram has another hit on its hands! My sincere thanks to Revell-Monogram for this review sample!